Oh but just think...when she says "back for another tank for your bamboo?" all sassy-like you can say "no, this one's for a Tetrapanax"...bet she won't know what the hell that is and might even think it's a Lizard or something...or you could just call it a T-rex and really play with her mind. A gardener's innocence is so heartrending . . ."I didn't think it would be so hard. . ." We have all been there. 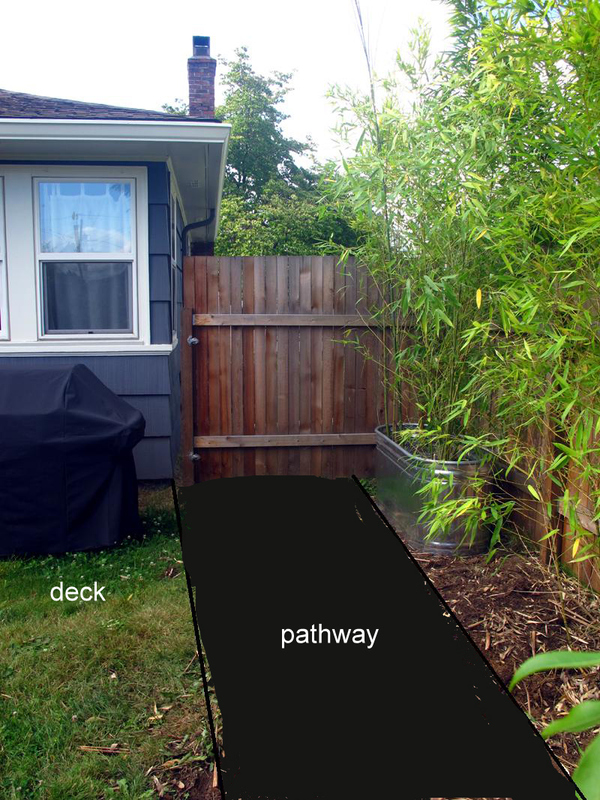 I've never moved bamboo three feet to the left, but I once tried to dig up and move amsonia (bluestar) two feet to the north. Same problem that you had. Your bamboo in a stock tank is much better. Trite, yes. Done before, yes. Necessary --- yes of course, and I would not roll my eyes. I think it looks great, and serves to keep that pathway narrowly planted. You did good. Another tank for the rest of the clump would be good if you can manage to dig any more up and if you can manage to ignore the saleslady. Heather the dragon-slayer...you do take on the biggies, don't you? Linnton Feed & Seed has stock tanks too, and they are unfailingly nice. Besides, things get to be cliches for a reason, dontcha know. Oh man...we got the same thing there...I'm pretty sure they can pick us out when we walk in. I'm always tempted to say that it's for my new Heifer...but fear they would ask follow-up questions and know I was a phoney ;-) Still, it's worth it to have those puppies contained! Very entertaining post. But let me suggest, when she asks if you're putting bamboo in the stock tank, you give a little snort and say, "You mean your customers still do that?" As if now you're going to have to reconsider patronizing such an out-of-it establishment. Unless you think she's going to visit your garden. I suspect that nearly everyone who plants bamboo eventually reaches this stage, you know, unless they live someplace where it grows wild. Totally love this story - the stock tank part, not the impenetrable bamboo roots. I do think you could put Tetrapanax in a stock tank there: we have a similarly narrow area planted with it, and it goes up more than out, so raising it about 2 feet in the tank would create even more room below.